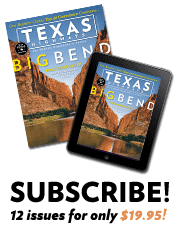 In this issue, Texas Highways celebrates the Big Bend region, where legend and lore demand a larger-than-life share of our collective imagination. The Big Bend magic springs from the amazing geography that makes it both tough and attractive. The rugged way of life creates an inviting challenge, and the personalities become tougher and more eccentric to match the land. Each visit to the region yields new insights and perspectives. Stretch, hike, soak, nibble, indulge, sleep, repeat. 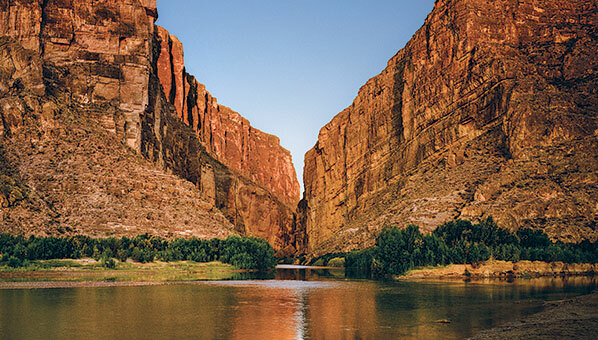 The Big Bend region beckons springtime visitors with sunny days, nippy nights, and much more. With its wide-open spaces, spectacular light, and breathtaking skies, the Big Bend fosters creative minds as unique as the landscape itself. The Chihuahuan Desert provides an ideal setting for a wide range of events, from car racing to ballooning, live music, chili cook-offs, and art festivals. The latest installment in our countdown of the Readers' Choice Texas Top 40 Travel Destinations takes us from the Panhandle to the Paluxy River and beyond. Name this museum and its city, and you could win a Marfa getaway! Enter by midnight on February 5th! We’re glad you asked! We just didn’t feel that a single paragraph did justice to the diverse cornucopia of events taking place each month in the Lone Star State. At the end of this month, we will launch the inaugural Texas Highways Events eNewsletter with expanded events coverage. In the meantime, don’t hesitate to head over to our searchable list of all Texas happenings, at the Texas Highways Events page. Find Texas Highways at your local newsstand. Boerne offers small town charm in a quaint, historic, picturesque setting. Visit this exclusive website and save up to 40% off Galveston’s top attractions. See spectacular Navajo weavings, including some never-before-seen creations, & one of the countryâ€™s premier art collections. Published monthly by the Texas Department of Transportation, Texas Highways, the official travel magazine of Texas, encourages travel within the Lone Star State and tells the Texas story to readers around the world.